WHAT IS INSANITY? 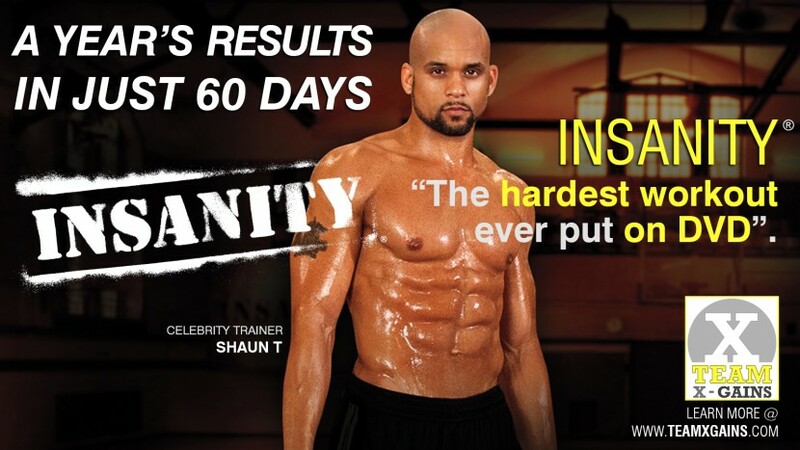 INSANITY® is a 60-day, cardio- based, total-body conditioning program that’s the most intense workout ever put on DVD. Fitness expert Shaun T drew on his collegiate track-and-field training, plus his subsequent years of experience as an elite trainer, to create a program that takes total-body conditioning to an extreme level. Just as P90X® is the height of resistance training, INSANITY is the pinnacle of cardio training. WHY IS IT EFFECTIVE? Interval training allows you to beat the “stress adaptation response,” which is what happens when your body gets used to exercising at one level of exertion and stops improving. An interval workout includes a set where you perform at your maximum, followed by one of lower intensity, with the cycle repeated to achieve a cumulative effect. WHAT IS 21 DAY FIX EXTREME? A 21-day program that features simple portion control, clean eating, and extreme 30-minute workouts, The portion-control containers take all the guesswork out of how much you should eat, The Eating Plan will tell you exactly what to eat and when—and how to eat cleaner than ever, This is how you get seriously shredded in 21 days. WHO IS 21 DAY FIX FOR? YOU SHOULD DO 21 DAY FIX EXTREME IF YOU: Are impatient to get serious results, Don’t want to make longtime commitments or have tried and failed at longer, more complicated diet plans, Are serious with a “No BS” attitude toward workouts and nutrition, Have a dramatic short-term weight-loss deadline, or need a final push to achieve the hardbody they’ve always wanted, Don’t have much weight to lose, but want to get shredded and have defined abs. X3 IS A TOTAL BREAKTHROUGH! "Hour-long workouts aren't for everyone. I get it...you've got commitments. You've got a life. You don't live in a gym. So working out for an hour every day? Well, for a lot of people...that just ain't gonna happen. But what if you could work out for just 30 minutes a day, and still get the kind of extreme results like the ones you see below. Sound good to you? It's not a sequel to P90X (or anything else). It's an all-new program of super-efficient workouts, each one packed with 30 minutes of concentrated intensity." P90X - TRANSFORM YOUR BODY IN JUST 90 DAYS! P90X® is a complete 90-day home fitness system designed to get you in the best shape of your life. Created by trainer Tony Horton, the program includes 12 intense workouts that use resistance and body-weight training, cardio, plyometrics, ab work, martial arts and yoga, along with a nutrition plan, fitness guide and workout calendar. And, as with all Beachbody products, P90X comes with a 100% SATISFACTION 90-DAY MONEY BACK GUARANTEE!